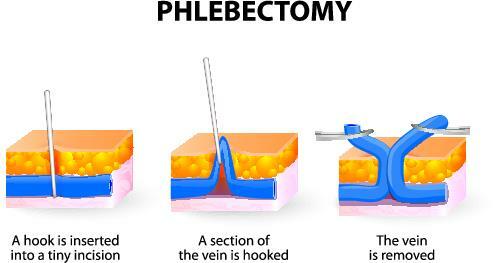 Stab phlebectomy is a procedure that removes varicose veins. We also call it ambulatory phlebectomy, micro phlebectomy, or stab avulsion. It is a low risk corrective procedure and usually follows a more definitive surgery for varicose veins like radiofrequency ablation (RFA) or endovenous laser therapy (EVLT). Stab phlebectomy is not routine. We only perform it if there are residual varicose veins that still remain after radiofrequency ablation or EVLT. Stab phlebectomies are not always required, even for people with large varicose veins. Treating the underlying venous insufficiency condition usually causes the veins to shrink considerably without further treatment. This is because the veins near the surface of the skin are no longer subject to high venous pressures. In fact, 90-95% of patients will not need this procedure because their veins become sufficiently smaller and less painful after vein ablation. Stab phlebectomy is for residual varicose veins after RFA or EVLT. Therefore, virtually all candidates are those who have already had vein ablation. Typically, about 10% of patients who have a vein ablation will still need stab phlebectomies because there are still symptomatic varicose veins. Usually, our protocol is to wait about two or three months after radiofrequency ablation or laser ablation. At that time, the vast majority of people will have significant shrinkage or disappearance of their veins. However, there is a small subset of patients who will still have large varicosities. It is important to realize that this does not mean that the procedure did not work. Rather, it is usually due to the development of new routes that open between veins and therefore the veins did not disappear completely. Often, this is because of what we call “perforator veins,” which are veins that communicate between the superficial and deep vein systems. In this case, we often decide to simply remove the remaining veins. We do this with a procedure called stab phlebectomies or ambulatory phlebectomies. Stab phlebectomy is almost always performed in the operating room with local anesthesia and a little bit of sedation. During this procedure, the surgeon makes tiny incisions to remove the large veins which remain under the skin. The incisions are less than 0.5 cm and do not require sutures. It is important to also locate and divide the perforator veins which often prevent the varicose veins from disappearing in the first place. After the procedure, the surgeon uses bandages and leg wrappings. Compression stockings follow to minimize bruising, swelling, and pain. Stab phlebectomies remove veins but this procedure is NOT “vein stripping.” Rather, it is just the removal of the varicose veins. Vein stripping, on the other hand, is the traditional and outdated removal of the entire greater saphenous vein using two small incisions in the leg. This was a painful surgical procedure that often left patients debilitated for weeks. In contrast, stab phlebectomies are not typically painful. It is an outpatient procdure, and most patients are back to work within a day. Typically, patients take just a little tylenol or motrin for a few days because there is usually not much pain associated with this minimally invasive procedure.